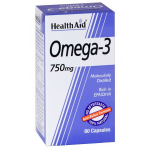 Omega 3 750mg Capsules are specially formulated using Norwegian salmon fish oil to give a highly concentrated source of Omega-3 Polyunsaturates, EPA and DHA in their free from for improved digestibility, assimilation and efficacy. A valuable supplement to help maintain circulation and cholesterol control as well as improve general wellbeing (heart, skin, joints) and brain function. What are Omega-3 fats ? 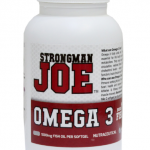 Omega-3 fatty acids are “good fats” that are essential for the body’s optimal functioning and metabolism. They may support improved blood circulation, reduced blood pressure and lower cholesterol levels – along with better immune function, brain function and fluid balance. Who can use Omega-3 fats ? Recommended usage: For adults, take 2 softgels per day with meals.